Are you looking for a rewarding volunteer opportunity? 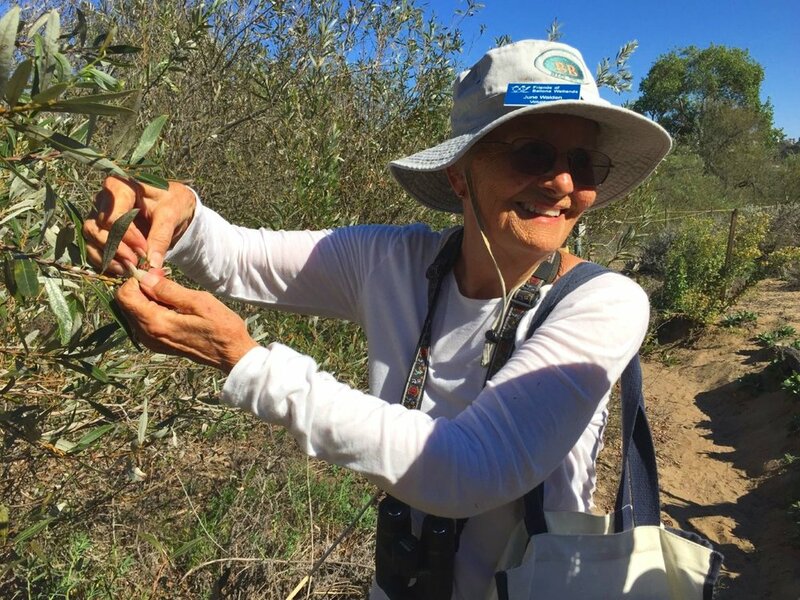 If you love learning, love plants & animals, and love sharing what you know with others, the Friends of Ballona Wetlands docent program could be just for you! Our docents are an enthusiastic group of volunteer teachers and nature guides who share their knowledge with visitors of all ages. They are an expressive voice for native, rare, and endangered plants and animals that Friends of Ballona Wetlands are striving to protect and preserve. Docents are Ballona’s ambassadors, engaging and enlightening the public on conservation, restoration, and research efforts. At the end of training, our docents gain a unique understanding of the flora and fauna here at the Ballona Wetlands, as well as an excellent knowledge of why wetlands matter worldwide. More importantly, they’re part of an effort to make a difference in our world! Educational Nature Guide - Every Monday, Wednesday, and Friday morning, K-12 students visit the Ballona Wetlands. Docents, staff, and education interns lead small groups through this outdoor classroom, teaching grade-specific curriculum, answering questions, and imparting the importance of stewardship to the next generation of nature lovers. Wetland Ambassador - Join education staff members on Tuesday and Thursday mornings as they visit nearby schools to teach about the Ballona Wetlands. Interactive grade-specific activities prepare students for an upcoming field trip, or review important concepts learned in the field after they return. Public Tours - On select weekends throughout the month, docents share their knowledge with visitors from near and far. Docents teach important facts about local ecology and history, and tailor their tours according to their own interests. Share what you love about the Ballona Wetlands! Community Events - Engage with the local community every month at our regularly scheduled Habitat Restoration and Creek Cleanup events. Help teach volunteers about native and invasive vegetation, or how trash from as far away as North Hollywood can end up in the wetlands, and lead groups of participants in hands-on activities that beautify Ballona. Special Events - The Friends host several awesome educational and fundraising events every year, including our annual Migration Celebration, family movie nights, yoga in the park, wine and paint, and more! At these events, docents interact with the public and answer questions, lead special tours, teach educational activities for children, run the science lab, do arts & crafts, help with greeting and registration, and many other fun and important tasks. We have several docent positions available. Please select the assignments that most interest you. Please describe what days and times you are available. Why are you interested in becoming a docent? Please share with us any special skills, interests, or experience that are helpful for being a docent. How did you learn about our docent program? Thank you! One of our staff will contact you regarding your application. Who can be a docent? Anyone 18 years or older who is passionate about nature and teaching others the importance of environmental stewardship can apply. You only need to commit to one event every month, but are welcome to sign up for more if it fits your schedule and interests. Docent training takes about 10 hours over multiple days and involves classroom learning as well as shadowing staff and other docents. Besides the immense satisfaction you'll feel when giving back to the community, docents also receive custom name badges, invitations to exclusive volunteer appreciation events, shoutouts in our newletters and social media, free FBW swag, and deep discounts on branded merchandise.